I'm torn. On one hand I like Firefox because of the incredible array of add-ons, especially for developers building web applications. On the other hand I love the performance I get from Safari and with the release of the version 4 public beta many of the new features. As a result I find myself jumping between the two browsers all the time, often keeping both open (one for browsing, one for my current web development project). Compound this with the fact that I have two Macs I use frequently—a Mac Pro and a MacBook Pro for meetings and travel—and my bookmarks are all over the place. I even have Firefox running on my Ubuntu workstation and would like my bookmarks there too. Fortunately I found a great solution for this problem: X-Marks. Though it started out as an add-in for Firefox they recently changed their name from FoxMarks to X-Marks and have started adding more browser support. 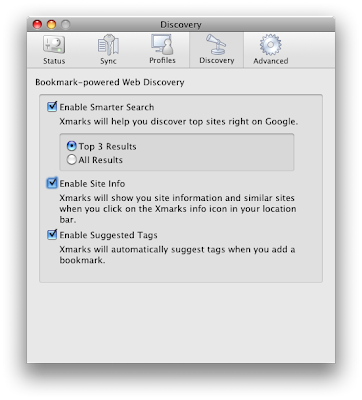 They now have a Safari add-on and this has solved my little bookmark problem. Working between multiple machines on multiple browsers is much easier with a tool like X-Marks. They also support IE so if you have a Windows machine at the office that's tied to IE and you have a Mac at home you can keep those bookmarks synched up. Now if I could find a free/low cost service that would keep my 1Password data securely synchronized between my machines (and not the Mobile Me service thank you very much), I'd be a very happy camper. Got one that you can recommend? Have a better bookmark synchronization tool? Please drop a note in the comments. 1Password recommends using Dropbox for synchronizing. And it works pretty well. @Syl: Outstanding - thanks for that note! I didn't realize 1Password supported that, nor the recommendation to use DropBox, one of my favorite utilities as well. For those interested in the details on how to do it, here is a post on the Switcher's Blog on how to set up 1Password to work with DropBox. I used XMarks when it was Foxmarks, and when it upgraded to Xmarks I found all the new discovery features mostly just annoying as hell. Fortunately you can disable these "features" easily enough (in Firefox) by clicking the Xmarks icon in the bottom status bar, choosing "Discovery", and then unchecking the 3 options. This will make the plugin do what it does best - synchronize my bookmarks. As other's have said. Dropbox is the recommended method to keep 1Password in sync. Even better than the Keychain + MobileMe. I have been using it for a few months now and never had a problem. Xmarks (aka Foxmarks) has been working brilliantly for me on two Macs, a PC desktop and a PC laptops spread across work and home. Even better is being able to use them on Firefox, Safari and IE. Would be great to have support for Chrome which is my default browser now on PC. I can also recommend Dropbox both in use with 1Password, but also in its own right. Its fast and seamless, and again enable me to work between four machines in two locations. They are currently beta testing a native iPhone app, which for me would be the last piece of the puzzle. When you combine these two services with Evernote (http://evernote.com) you truly have a cross platform solution to most problems. OK, I've got 1Password's Agile Keychain now stored on my Dropbox drive and it synchronizes perfectly between my two Macs. Now I have all my passwords up to date in real time on both machines and in the different browsers I use. @Syl: Thanks again for pointing that out! Very, very handy. @ David Alison: my pleasure. Glad I could contribute for once, I have been a regular reader to your blog which I find very interesting. Keep up the good work. very interesting... I use the delicious addon for firefox which works great between my work PC and personal macbook... But it's a bit more tricky to access them in other browsers, since you have to go to the delicious website.. will definitely look into this! thanks! I was gonna comment on using Dropbox to sync your 1Password but glad others have already pointed you in that direction. It works wonderfully well. 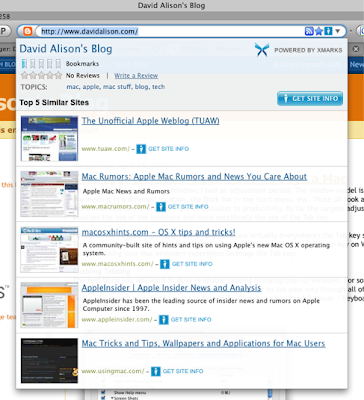 Like you, I love the fact that Xmarks works across all the major browser and platform. Now that I am able to sync my 1Password using Dropbox, my only wish is a 1Password app for my windows box as well. I love the windows world as much as my mac world, and like using the strength of each platform to my own ends. Keep up sharing your experiences with the mac platform. For the bookmarks sync, i came across a review on Mac360º that mentions Bookit (http://www.everydaysoftware.net/bookit/) and Bookdog (didn't get the link for that). @Necromancer: Thanks for mentioning the other products - choice is always a good thing!